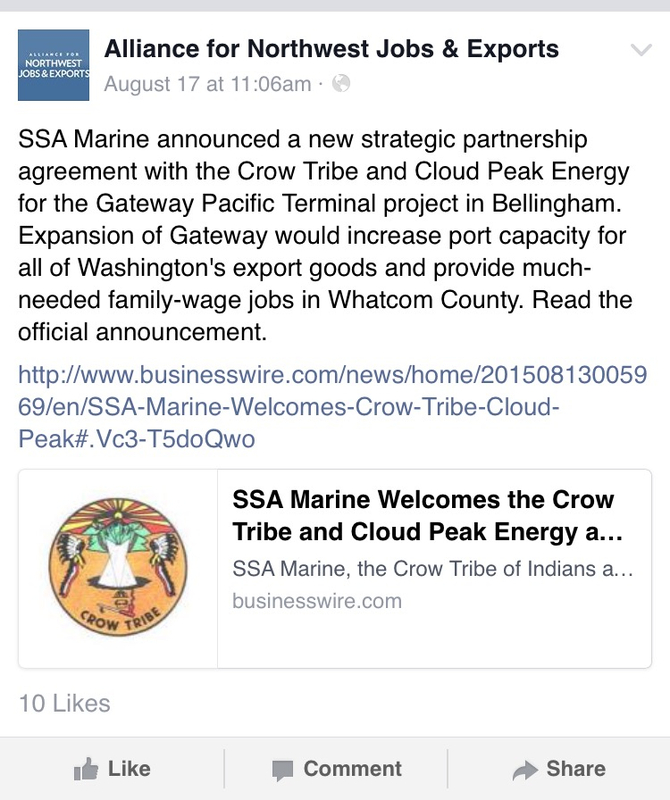 An August 13, 2015 joint press release issued by SSA Marine, Cloud Peak Energy, and the Crow Tribe announced that, “the Crow Tribe and Cloud Peak Energy are joining SSA Marine as partners in the Gateway Pacific Terminal.” The proposed Gateway Pacific Terminal (GPT) project, if permitted and built, would be sited at Xwe’chi’eXen (Cherry Point), in the northwest corner of Washington state, along the Salish Sea shoreline. The water, tidelands, and land at Xwe’chi’eXen (Cherry Point) are within the Lummi Nation’s traditional territory and its usual and accustomed fishing grounds and stations, which are protected by the Treaty of Point Elliott of 1855. The proposed terminal would handle and ship 48 million metric tons of coal annually from the Powder River Basin in Montana and Wyoming, making it the largest coal export terminal in the U.S., and making it a threat to the Lummi Nation’s treaty-protected fishing rights. While the press release outlines the recent investment by Cloud Peak, it does not make clear what entity Cloud Peak invested into for its stake in the GPT project. A phone call to Cloud Peak Energy Investor Relations department confirmed that the entity which Cloud Peak invested into, giving it a 49% stake, is Pacific International Terminals (PIT), a subsidiary created for the GPT project by terminal applicant SSA Marine. Never mentioned in the press release, is PIT, the entity into which Cloud Peak paid $2 million for its 49% stake. Most people would consider that to be important information for the public and investors to know. Watters puts the Crow Tribe first in his quote, calling the Crow Tribe a “strategic partner” even though at this point, the Crow Tribe only has an “option” to secure 5% from Cloud Peak’s 49% stake in PIT/GPT. An August 21 email to Cloud Peak’s Investor Relations asked the question: If in the future, the Crow Tribe exercises its option to secure 5% from Cloud Peak Energy, what would then happen to the Crow Tribe’s 5% stake if Cloud Peak Energy should choose to “exit its investment”? “If the option is exercised, the Crow Tribe would retain their 5% ownership. It is unlikely that the Crow Tribe would exercise their option during the permitting phase, which is the only time that Cloud Peak has the ability to exit the investment.” This information was confirmed in an email from Karla Kimrey, Vice President of Investor Relations for Cloud Peak. 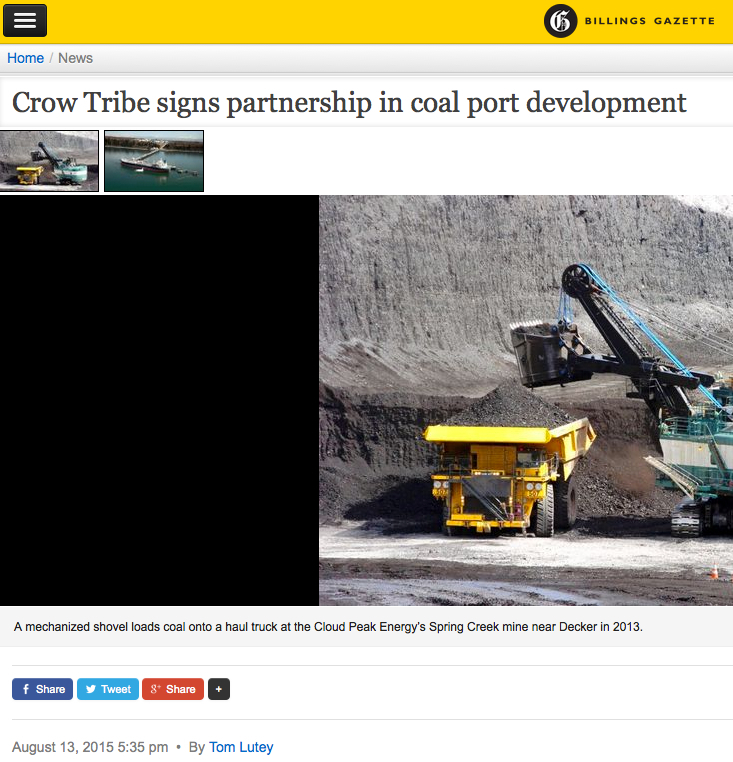 The idea that the Crow Nation would not likely exercise its 5% option with Cloud Peak during the project’s permitting phase, is supported in news articles such as the August 14, 2015, Billings Gazette article entitled, “Crow Tribe signs partnership in coal port development.” The article reported that, “The cost of the Crow buy-in will not be determined until the project near Bellingham, Washington, receives environmental approval from the U.S. Army Corps of Engineers.” The headline, however, gives readers the impression that the Crow Tribe now has partnership status, yet there has been no investment made by the tribe. An August 14, 2015 AP article in The Bellingham Herald reported that Cloud Peak spokesman Rick Curtsinger explained that if the Crow Tribe exercises its ownership option, the tribe would be responsible for 5% of the construction financing for the project. Construction costs for Gateway Pacific have been estimated at $700 million. That 5% would be a hefty number, $35 million, for which the Crow Tribe would be responsible. 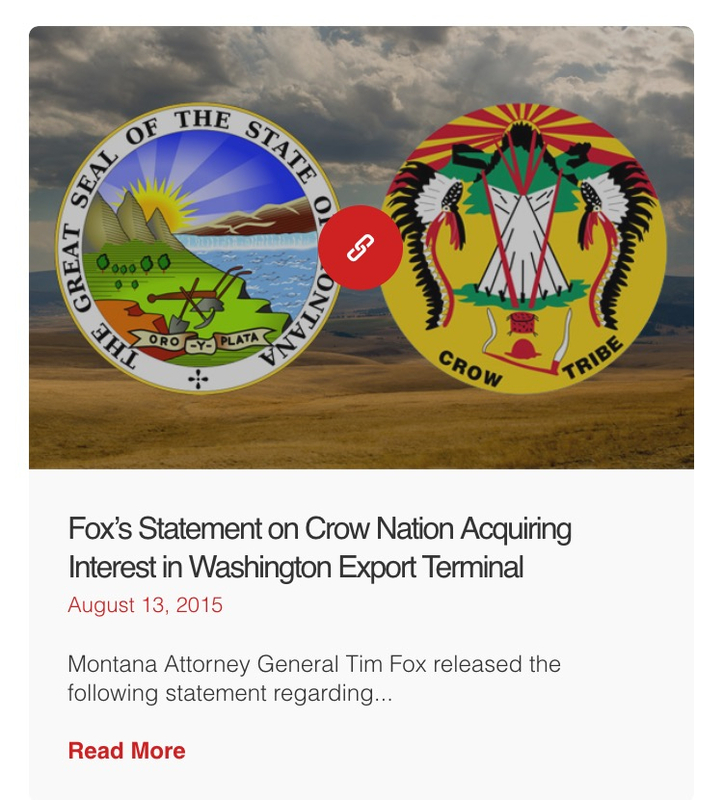 The first sentence of Fox’s statement asserts: “Today’s announcement that Montana’s Crow Nation will acquire an interest in the proposed Gateway Pacific export terminal further reinforces the need for a fair and lawful permitting review process. . .” The press release and statement never mention that the Crow Nation merely has an option to secure 5% of Cloud Peak’s 49% stake. The word “option” does not even appear in the attorney general’s press release and statement, and Cloud Peak Energy is never mentioned—only the Crow Nation is. The entire focus of Attorney General Tim Fox’s statement is placed on the Crow Tribe. The noticeable omission of the critical information that the Crow Tribe would need to exercise and secure its 5% option with Cloud Peak seems irresponsible when coming from a state’s attorney. Montana Billings Gazette reporter Tom Lutey, who authored the August 14 Billings Gazette article referred to above, never mentioned the word “option” in his accounting of what he described as a partnership of the Crow Tribe with SSA Marine. The fact that the Crow Tribe would have to secure its potential 5% option from Cloud Peak’s 49% stake in PIT/GPT was also omitted in the article. The last paragraph of the article reported that “Montana Attorney General Tim Fox said that Crow ownership in the terminal project affirms the need for a continued environmental review process.” Thus, Montana media becomes instrumental in reinforcing and disseminating Fox’s misleading information to a wider audience. Promoting similar messaging to that of SSA Marine, coal industry-backed legislators like Montana’s U.S. Senator Steve Daines and Congressman Ryan Zinke have been attempting to ensure that the Army Corps complete the EIS for the GPT project prior to it making its determination relating to the Lummi Nation’s request. That determination refers to whether impacts from the GPT project to the Lummi Nation’s treaty rights would be greater than de minimis (too small or trivial to warrant legal review). Any impacts considered to be greater than de minimis by the Corps would warrant the GPT permit denial requested by the Lummi Nation. Along with leading 17 members of the House in sending a letter to the Army Corps of Engineers urging the agency to complete the environmental review process for the proposed GPT project prior to the Corps making its determination, Congressman Zinke traveled to Whatcom County last week. 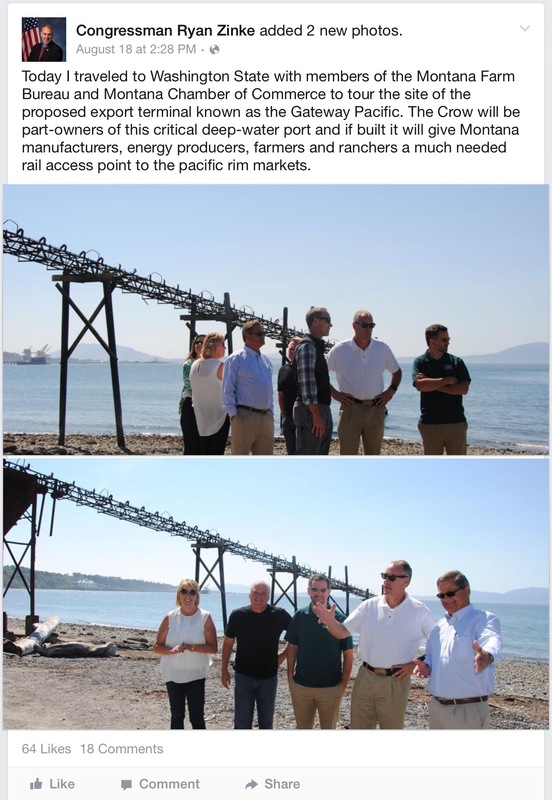 On August 18, five days after the announcement of the “strategic partnership” between SSA Marine and Cloud Peak, and potentially the Crow Tribe, the congressman and two other pro-GPT Montanans; Glenn Oppel, Government Relations Director for the Montana Chamber of Commerce; and Hans McPherson, Vice President of the Montana Farm Bureau, came to Whatcom County to tour the proposed Gateway Pacific Terminal site at Xwe’chi’eXen (Cherry Point). The Montana delegation touted what they see as benefits that GPT will provide for people here, and to people in Montana and the Crow Tribe. In an August 19 Bellingham Herald article, reporter Ralph Schwartz wrote that on August 18, after the Montanans toured the proposed GPT’s Cherry Point site, they met with reporters; though he did not specify those reporters, nor what publications were represented at the meeting. Mildly curious, I tried unsuccessfully to find out from Ralph Schwartz who those reporters were who attended the meeting with the Montana officials. Then, becoming more curious, I decided I wanted to include information on that subject in an article. I contacted the various daily and weekly news publications in Whatcom County, asking the editors if they had been alerted to the meeting, and if so, had they attended the meeting. The following publications were contacted: Ferndale Record, Lynden Tribune, The Northern Light, Cascadia Weekly, and the Bellingham Business Journal (BBJ). Editors from both Ferndale Record and Lynden Tribune said their publications were invited, but their reporters were unable to attend. BBJ Editor Oliver Lazenby told me he was invited and attended the meeting, and that he authored an article about the Montana delegation’s visit. He also said that Craig Cole, SSA Marine’s local spokesperson for the GPT project, SSA Marine VP Bob Watters, and Northwest Jobs Alliance (a GPT advocacy group) President Brad Owens and Chair John Huntley were present at that meeting. The editors from both Cascadia Weekly and The Northern Light said their publications were not invited to the meeting. Selectively inviting publications to particular events, allows SSA Marine and its public relations representatives to control the message about GPT that it disseminates to the public. In some cases, SSA Marine has sent out a press release after an event has already occurred, thereby eliminating some press from participatory involvement in the event altogether. This can result in reporters passively reporting on an event, by basing their stories on the information contained in the press release. The email invite to the meeting with the contingent from Montana, was sent by a local public relations representative for SSA Marine, Dave Brumbaugh, a Lynden resident. Brumbaugh’s email billed the meeting as a “non-public media event,” which was held at 103 E. Holly St., in suites 210-211 of the Old Bellingham Bank Building. 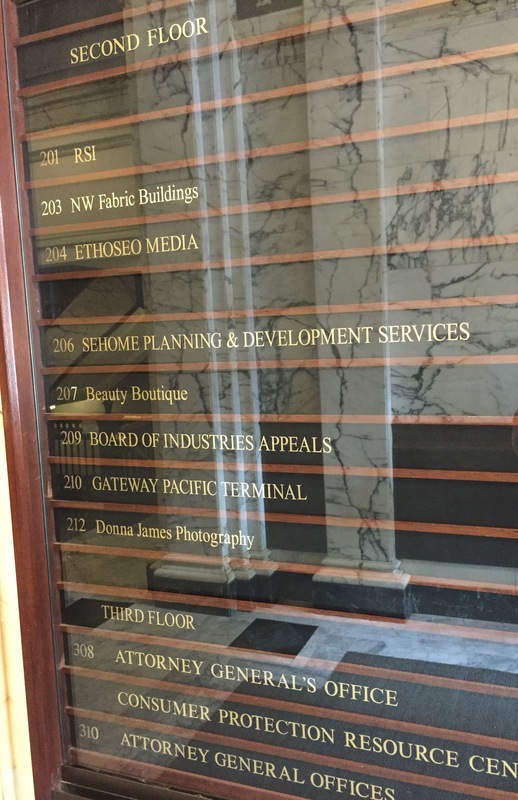 A recent visit to that address showed, “Gateway Pacific Terminal” listed in the lobby directory and on a sign next to the office suite door. The office was closed. Peering through the shuttered window and door revealed only a conference table and chairs. 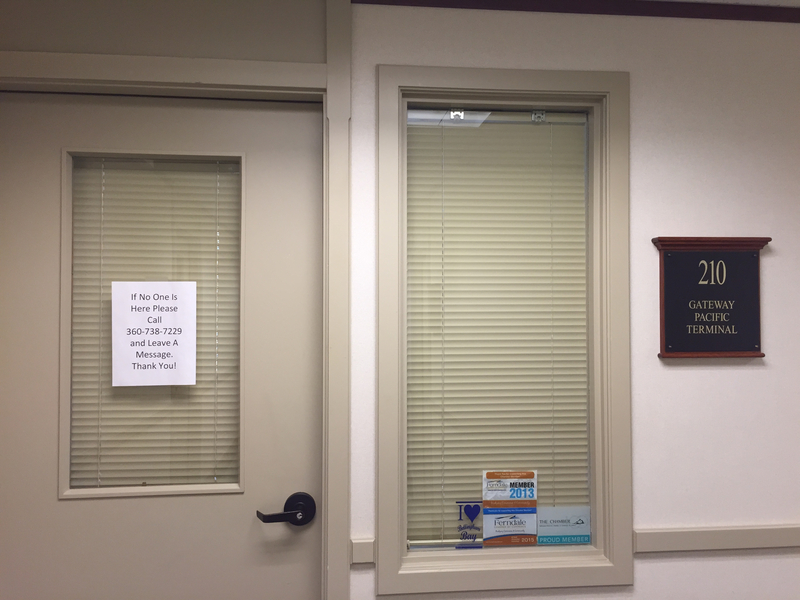 There was a sign on the door instructing visitors to the office that, “If No One Is Here Please Call 360-738-7229 and Leave A Message. Thank you!” That same phone number is listed as the contact number for GPT on its gatewaypacificterminal.com website, listed underneath a Bellingham P.O. Box address. A call placed by a local citizen to the GPT phone number was answered by a woman who said, “Gateway Pacific Terminal.” After she was asked if there was an office for GPT in Bellingham, before answering the question, she first asked the caller: “Who is is this?” and “Why do you want to know?” The caller, after providing their name and explaining they were curious about a GPT office location, was told by the woman answering the call, that there are locations around, but there is not an actual office. When asked about the office suite location in the Old Bellingham Bank Building, she explained that it is more of a meeting room/conference room. 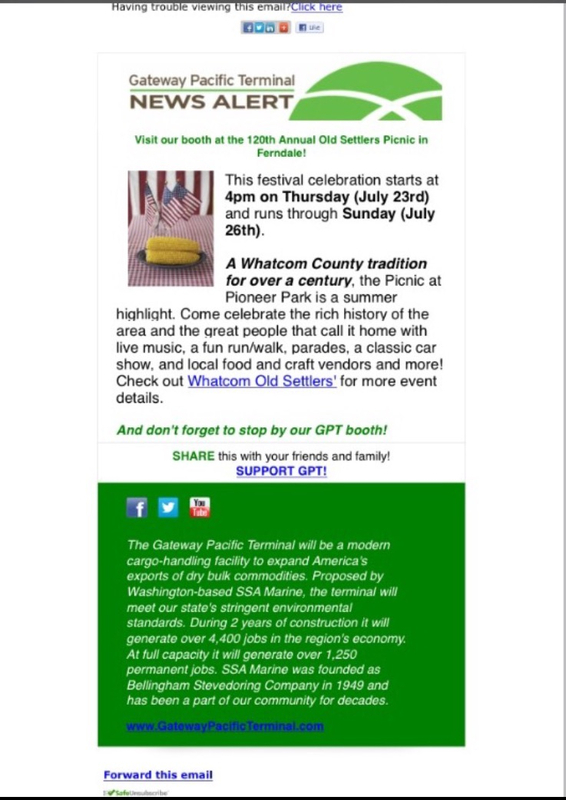 In its advertising, SSA Marine/PIT presents Gateway Pacific Terminal as a member of the local community, yet when an employee answering calls for GPT is asked a simple question about an office location, a local citizen calling the number publicly displayed for GPT is questioned as to their name, and why they want to know that simple information, and is told there is no real local office for GPT. -An August 13, 2015 press release announced that Cloud Peak signed an agreement giving the company a 49% stake in GPT (PIT is the entity that Cloud Peak invested into), and that the Crow Tribe has an option to secure 5% from Cloud Peak’s share. It is important to note when referring to Cloud Peak’s 2013 agreement with the Crow Tribe, that Cloud Peak’s 2014 Annual Report states: “Future production and sales of such tons [the estimated 1.4 billion tons of in-place Crow Project coal], if any, are subject to exercise of options. . .” The phrase “subject to exercise of options,” is repeated twice in Cloud Peak’s 2014 Annual Report, in the section regarding the Crow Project. It remains to be seen whether Cloud Peak will ever actually exercise its option to develop a mine on Crow Reservation land. These agreements involve options. Options can be exercised—or not. In the case of Cloud Peak’s newly acquired stake in PIT/GPT, it has the option to exit its investment at its discretion anytime during the permitting phase and return its ownership interests to SSA Marine. That makes it sound as easy as returning a toaster to a Target store. The Crow Tribe has an option to secure 5% from Cloud Peak’s 49% stake in PIT/GPT, but according to Cloud Peak Investor Relations, if the Crow Tribe were to exercise its 5% option, it is unlikely that would occur until after the permitting phase. There are extended timelines built into the agreements that seem to coincide with GPT proponents’ expectations for an environmental review/permitting phase timeline for the project. So, it is likely that we won’t know if any of these options and potential plans might ever happen until after the environmental review/permitting phase which they expect to be a couple of years out. That couple years out timeline estimate stands unless the Army Corps agrees to the Lummi Nation’s request to take immediate action to deny the GPT permit. In the meantime, these options can be advertised and promoted to the public in such a manner as to give the impression that these optional deals are already sealed. The idea that Cloud Peak would mine Crow coal, or that Cloud Peak will continue its 49% ownership in PIT/GPT, or that the Crow Tribe would secure a 5% ownership share in PIT/GPT is speculative—just like the market for exporting coal, and the inflated GPT project job numbers touted by SSA Marine. All of this is akin to a near vacant office bearing the name of a project that has neither been permitted, nor accepted by the community to which it pretends to belong. Ms Robson’s article, as always, dives deep into the whole story and allows us to pierce the veil of misleading, or purposely directed story telling. The whole story allows each citizen to make an informed decision on actions that will directly impact their lives. One citizen CAN make a difference…we must never forget this!